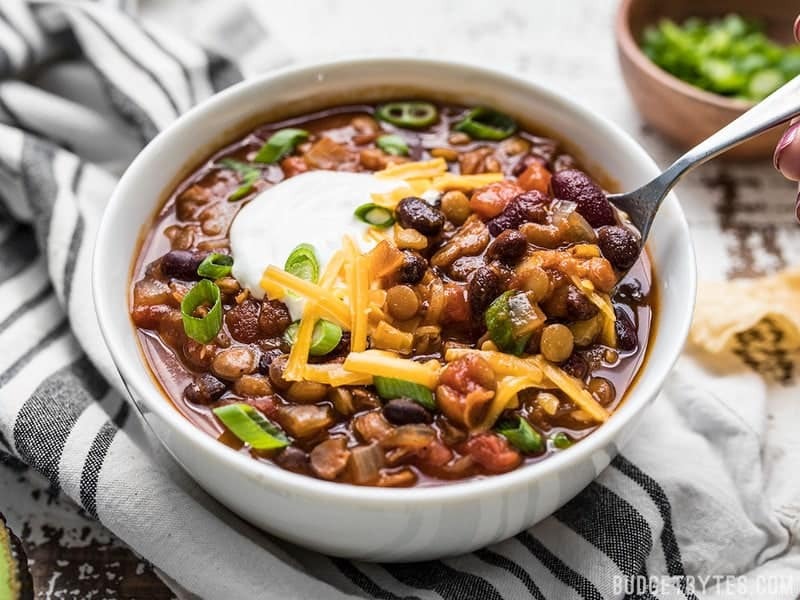 I’ve written and priced this recipe for Slow Cooker Vegetarian Lentil Chili as just the chili itself, without toppings because toppings are very personal, and often depends on what is already on hand. I love adding something creamy (cheese, sour cream, or avocado), something green (green onion, cilantro, or avocado), and sometimes something starchy (tortilla chips, oyster crackers, cornbread, or crusty bread for dipping). 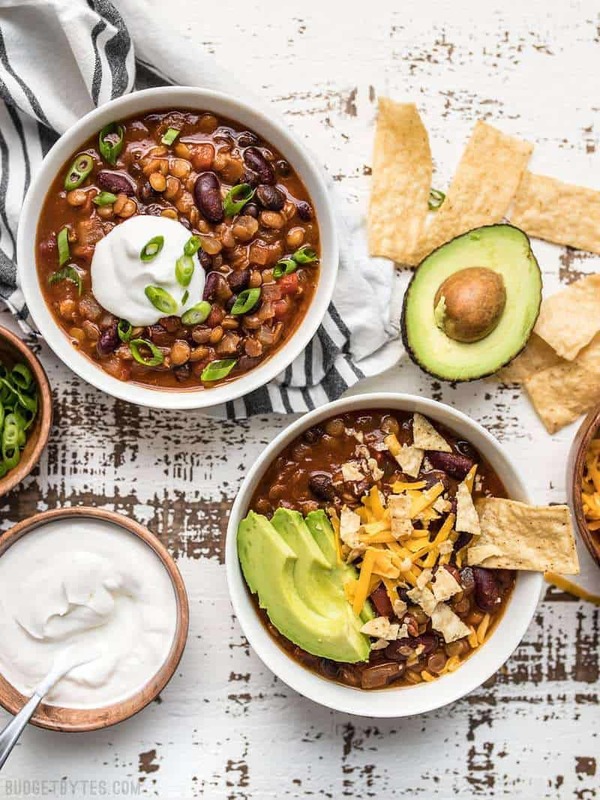 Make the chili your own with the toppings and take advantage of this opportunity to use up some leftovers from your fridge! 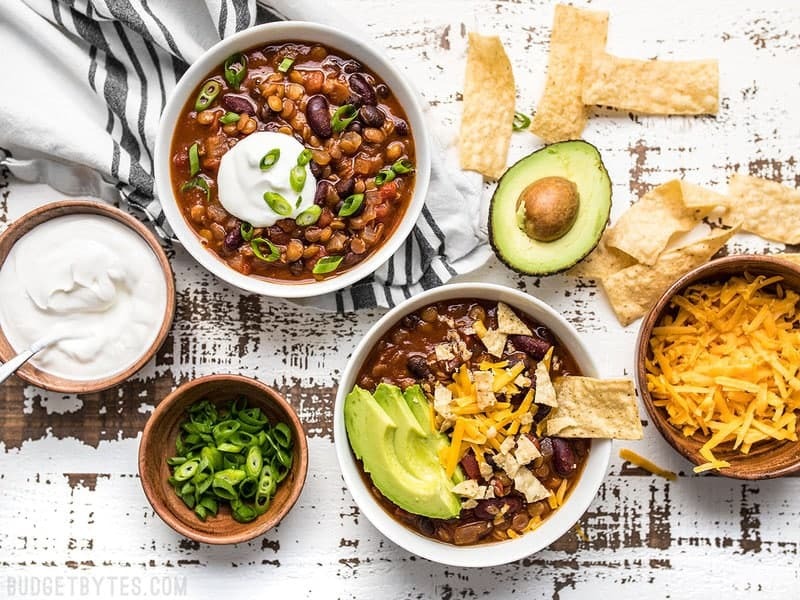 This chili is extremely freezer friendly, so as soon as you’re done cooking it, I suggest dividing it into single portions. Once those portions have cooled completely in the fridge, transfer at least a few to your freezer for long term storage. 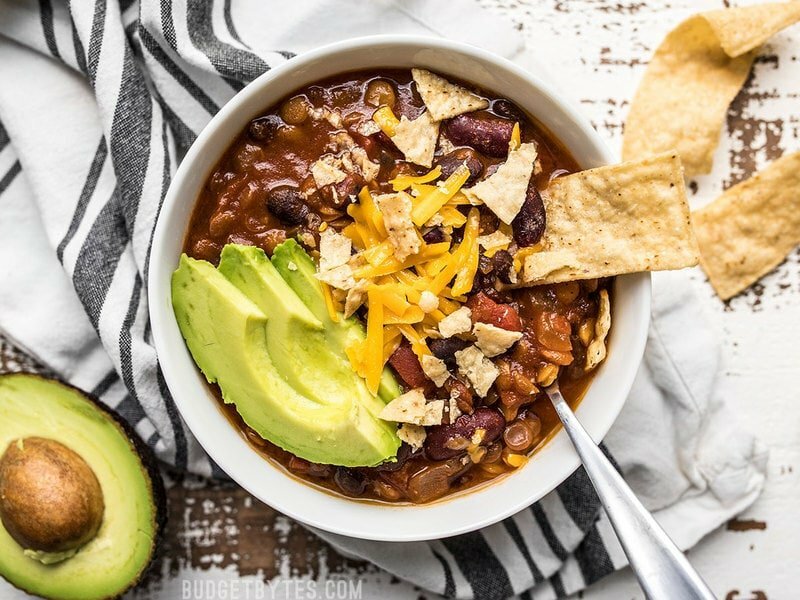 You can take one out at a time whenever the craving for chili hits and reheat either in the microwave or in a pot on the stove. 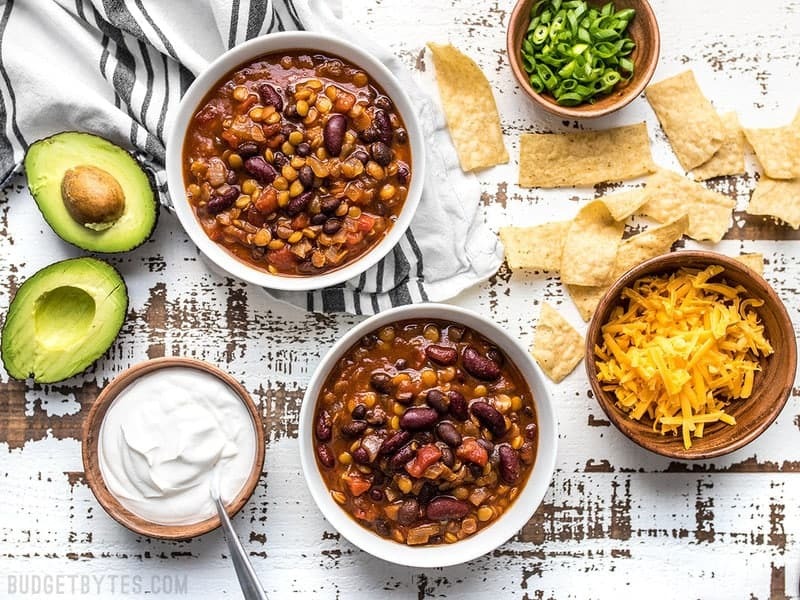 This Slow Cooker Vegetarian Lentil Chili makes a huge batch, is packed with flavor and nutrients, and can be made for only about 5 dollars! Dice the onion and mince the garlic. Add the onion and garlic to the slow cooker, along with all the other ingredients to the slow cooker. 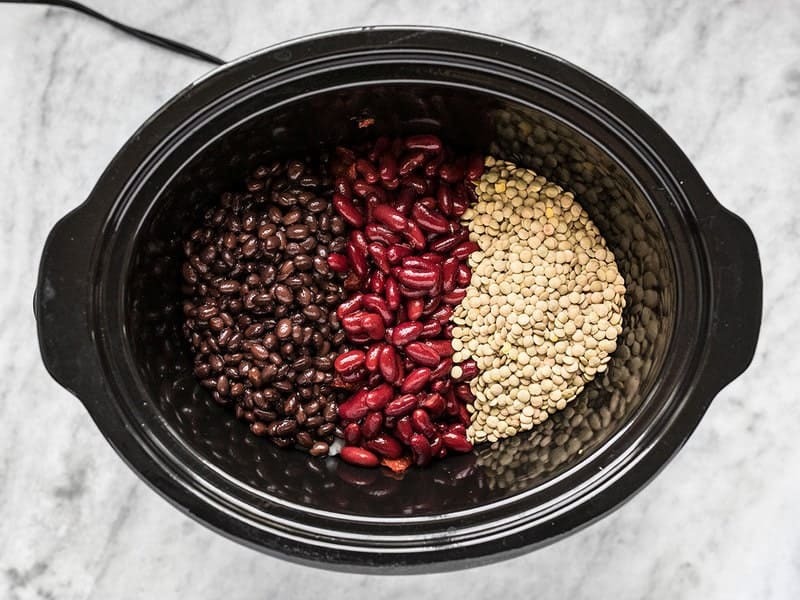 Stir the ingredients in the slow cooker to combine. 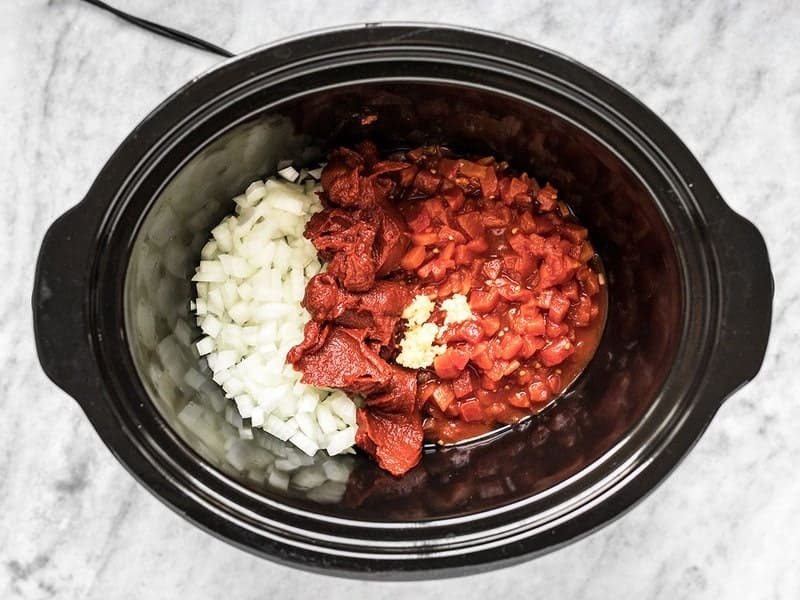 Place a lid on the slow cooker and cook on high for four hours (or low for 8 hours). After cooking, the lentils should be tender. Taste the chili and add salt to taste, if needed (this will depend on the salt content of your broth). Serve the chili hot, with your favorite toppings. *I like to use coconut oil because it has a similar mouth feel to animal fat, but it does give a slight coconut aroma to the chili. Feel free to use your favorite oil or fat in its place. 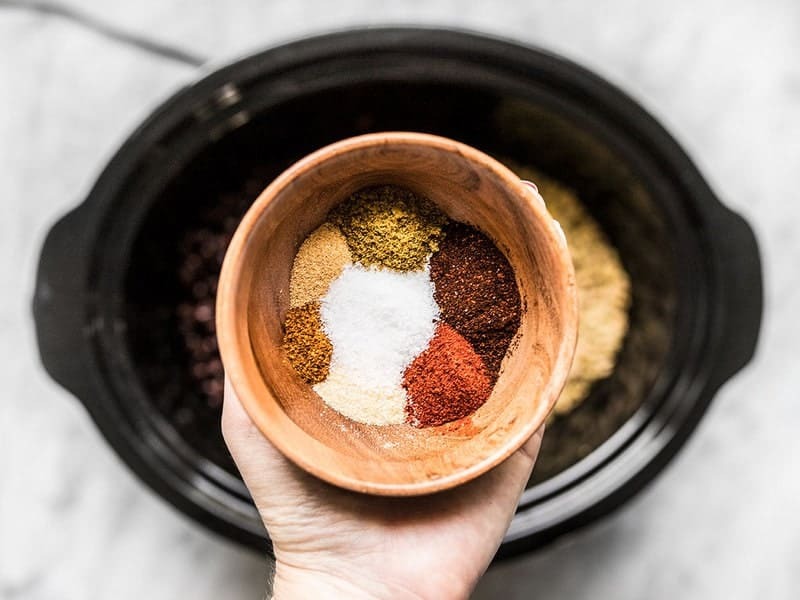 1 Tbsp chili powder, 1 tsp cumin, 1 tsp smoked paprika, 1/2 tsp onion powder, 1/4 tsp cayenne pepper, 1/4 tsp garlic powder, 1/2 tsp salt, and some freshly cracked pepper (about 20 cranks of a pepper mill). If you don’t have a well stocked spice cabinet, you can substitute one packet of store bought chili seasoning. Also add 4 cups vegetable broth and 2 Tbsp coconut oil. I like to use coconut oil because it has a similar mouth feel to animal fats (because it’s a solid saturated fat), but you can use your favorite fat or oil in its place. Give everything a good stir to distribute the spices and tomato paste. 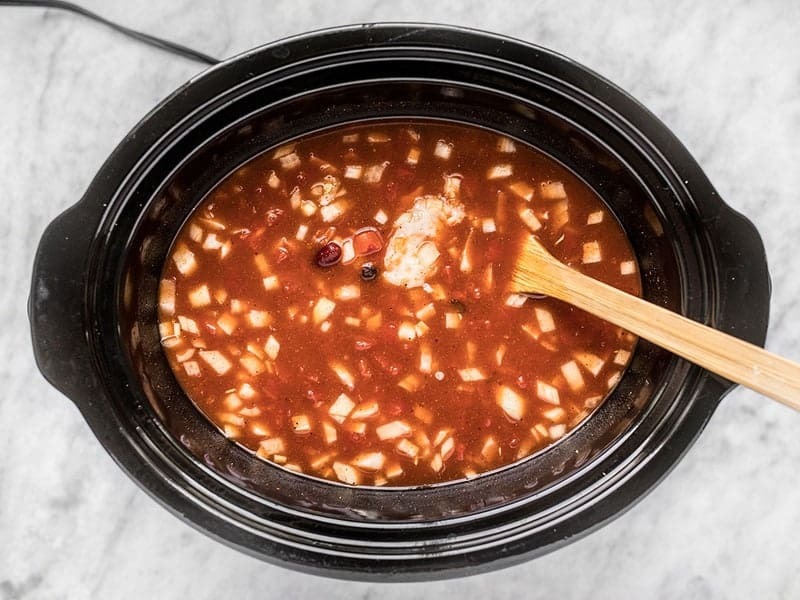 Place the lid on the slow cooker and cook on high for four hours (or low for eight hours). Once it has cooked the lentils should be tender. Give it a taste and add salt if needed. Then grab whatever toppings you have in your fridge and GO TO TOWN. My family’s favorite chili recipe, bar none. Something about the lentils gives it a meaty feel (even without the coconut oil). The smoked paprika makes it really special. Yes, uncooked and dried are the same, but you do not need to soak them. They cook quickly, even without soaking, unlike beans. They will expand in volume when you soak them, so if you measured after soaking you’ll have an incorrect amount. I added 1 tablespoon liquid smoke, 4 tablespoons of maple syrup, 2 sweet potatoes (cubed), and 2 tablespoons of lemon juice at the end. I looove the sweet-savory flavors mixing together, so good. I calculate about 1800 calories with my additions, 1400 without. Might just be my slow cooker, but after 3.5 hours on high it started simmering pretty hard, so I turned it off since it was done. This is easy and delish! I drained and rinsed my beans, just because I usually like to with canned beans. I poured myself a bowl right after 4 hours on high and then realized a few bites in that the lentils were still a little bit undercooked (not all of them, just the occasional semi crunchy one). I ate my bowl anyways (oops) and ended up letting the rest of the chili cook on low for an additional 2 hours while I watched a movie and the leftovers today taste perfect! And nothing suspicious happened to me from the slightly underdone bowl. I think I was guilty of stirring too often and maybe that’s why the lentils needed longer. Topped it with pepper jack and sour cream and it is great! This recipe is delicious! I made it on the stove top and followed some of the guidelines from other comments. I left the lentils out until about 20 minutes before the chili was done simmering. Freezes well, too! Absolutely fantastic and my favorite recipe from BudgetBytes. 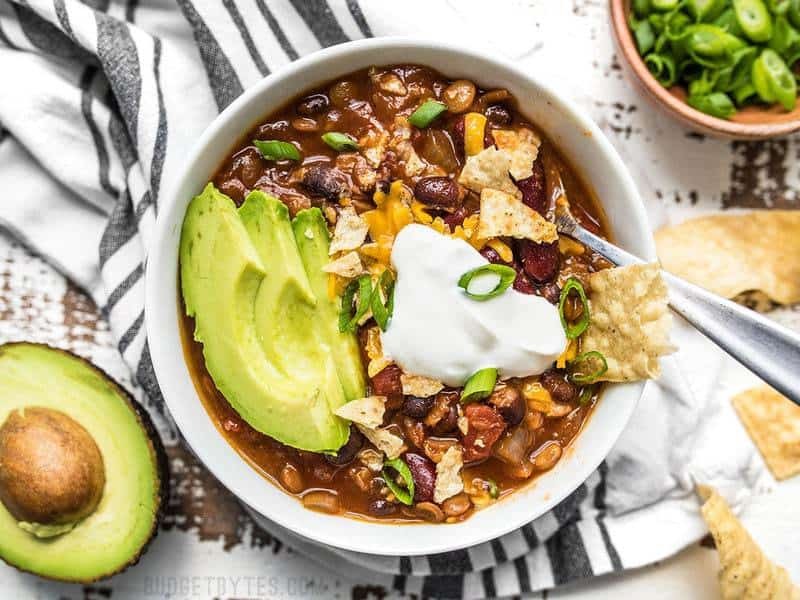 We’ve made this chili every Sunday for the past 3 weeks and it is perfect for our week-end meal with toppings of freshly shredded cheddar, a dollop of sour cream, some chopped green onion, sliced avocado, and crinkled tortilla chips as suggested. Aside from our Sunday night meal, we always have enough servings that we use for several lunches or leftover dinners for the chilly weekdays. Very hearty – love it! This is my favorite for making lunches all week! Thank you for this! Great chili but needs more liquid. It comes out too dry. I would add one to two coups of broth. 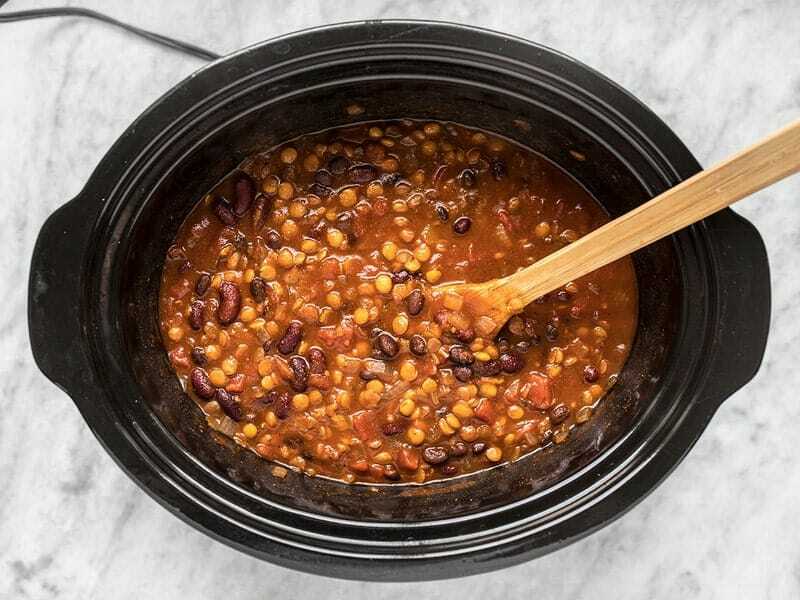 Do you need to soak the lentils overnight before making the chili?